SACRAMENTO, CALIFORNIA (May 17, 2017) - The Pacific Challenge Series presented by PenneyLawyers.com will hold its third race of 2017 and the first round of the Tri-Holiday Classic Series on Saturday night at Stockton 99 Speedway. 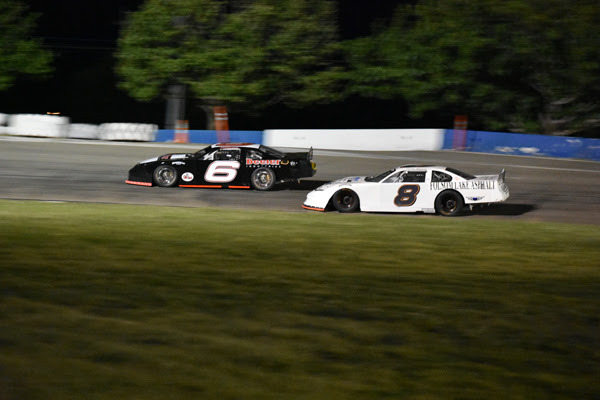 The historic quarter-mile has been a mainstay in the series and will again host PCS races on, or near, all three major holiday weekends - Memorial Day, Independence Day, and Labor Day. This weekend's race will be a 100 lap contest joined by the track's fast growing Stockton Late Model division, Bombers, and the Legends of the Pacific. A second place finish at Shasta and a third place effort at Madera has 2015 PCS champion John Moore of Granite Bay sitting atop the series standings. Moore won the 2015 July Tri-Holiday race at Stockton and is eager to return to victory lane at a track where he has extensive experience. Moore has six PCS starts at the speedway including a win and five top-fives. 2014 PCS champion Mike Beeler of Modesto won the 2016 July Tri-Holiday race and the 2015 September Tri-Holiday race. He has finished in the top-two in the points in all three of his full-time seasons in the PCS and currently ranks second in 2017. Beeler's Stockton resume includes nine starts, two wins, five top-fives, and eight top-tens. Third in the championship standings is Jason Romero of El Dorado Hills. The four time Roseville winner in 2016 has had a remarkable streak of wins and fast-times in the last two years. He has set the fast-time or track record at four of the five tracks on the circuit including fast-time in his Stockton debut last September. Romero recovered from early race spin to finish second in the season opener at Madera and salvaged a top-ten after a flat tire at Shasta. Galt's Matt Wendt is fourth in the points standings with the two-time Super Stock Tri-Holiday champion poised for a strong performance on Saturday night at his home track. Wendt was unable to close out a top-five finish in the three Stockton events last year despite running within the top-five in each race. Rounding out the top-five in the points is Travis Milburn. The Eagle, ID driver who graduated from St. Mary's College won Tri-Holiday #3 last September. He rebounded from a 12th place run to start the year at Madera by scoring a solid fourth place finish at Shasta. His rookie teammate and cousin Jack Wood ranks sixth in the standings and also lead the Rookie of the Year battle with Watsonville's Alexander Mead. Valley Springs' Tracy Bolin has been snake-bitten with gremlins this year but has managed seventh in the points with 2015 Rookie of the Year Cole Moore of Granite Bay, Chris Scribner of Loomis, and Madera winner Carlos Vieira rounding out the top-ten. Engine troubles at Shasta have sunk Mead and Elk Grove's Mike Hite to 12th and 14th respectively. JD Motorsports, led by two-time PCS champion Jeremy Doss, intends to make their presence felt at Stockton Saturday night. Doss is a the three-time Stockton PCS winner while his teammate Jeff Bischofberger has won an SRL event at the quarter-mile. Fresh off his Shasta Speedway victory, Derek Copeland of Anderson, CA looks to maintain the momentum as he makes his first Late Model start at Stockton. Hayward's Danny Malfatti is also expected to return to competition along with long-time Stockton driver Ross Strmiska who has made seven PCS starts at Stockton with four top-tens. Activities get underway on Friday with practice. Gates open at noon with cars on the track at 4 p.m. Pit gates open at 1 p.m. on Saturday with the first practices at 3 p.m. The grandstands open at 5 p.m. with racing at 6 p.m. Pit passes are $40 per day for members but two-day passes will be at the member price for $80. Grandstand tickets are $20 for Adults 16+, while Jr. 11-15, Military with ID, and Seniors 60+ are $15. Kids 10 and under are free. A family pack for 2 Adults and 2 Jr. is $55.